Through simple flow charts, this 47 page book explains exactly what steps to take to set up a business. We cut through the clutter, and reveal the easy steps you take to run your business. 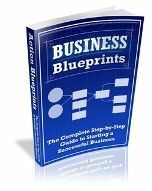 Business Blueprints contains mindmaps, flow charts and checklists to help you set up your business. What’s more, it’s aimed at setting up a business like yours, so there’s no unnecessary waffle. The book is not available anywhere else, nor is it available to the general public. So if you get confused by all the advice on the best way to launch a new business, you need Business Blueprints. Your book comes as a download once you’re registered on the course.